Acclaimed as one of the finest violinists of his generation, Byung-Kook Kwak enjoys a multi-faceted career as a soloist, chamber musician, conductor, and educator. From coast to coast, critics have hailed him as a premier violinist whose musical gifts and technical wizardry are powerful and sensitive. 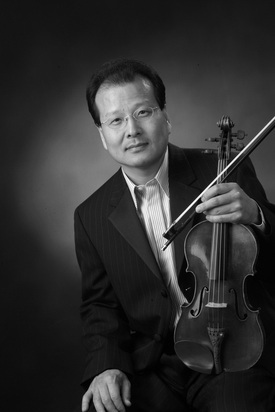 Mr. Kwak has performed with orchestras throughout North America, Europe, Asia, and Scandinavia. Finalist and prizewinner of many international competitions, he was featured on PBS Live from Lincoln Center as a member of the renowned Sea Cliff Chamber Players. He has taught at Lehman College, Music Conservatory of Westchester, and Mannes College for 10 years as an assistant to Aaron Rosand. He is currently a faculty member at Manhattan School of Music, Pre-College, Queens College, and Nyack College. In addition, he also performs and gives master classes regularly in Seoul, Korea. Mr. Kwak has occupied himself with a busy conducting schedule as well. He has been the conductor of the Summit Music Festival Orchestra for five years, has conducted the Queens Symphony Orchestra, and the Manhattan School of Music Summer Festival Orchestra from 1999 to 2006. He has been engaged as a guest conductor with the Long Beach Symphony, South Shore Symphony, Yonkers Philharmonic, State Repertory Opera, and the Queens Symphony Orchestra, as well as the Orchestra of the Westchester Conservatory of Music. As a founder and artistic director of Solisti Ensemble, he has performed with the Ensemble in Stern Hall at Carnegie Hall, Alice Tully Hall at Lincoln Center, and Zankel Hall at Carnegie Hall. He has also been active as a choral conductor for over thirty years, and has lead countless performances of Handel’s Messiah, Beethoven 9thSymphony, as well as many of the major choral works with Central Presbyterian Church Choir where he is serving as a music director. Born in Seoul, Korea, Mr. Kwak was hailed as a child prodigy. He made his orchestral debut at the age of 7 with the Seoul Philharmonic. After earning much accolade and winning prestigious competitions in his native country, Mr. Kwak came to the U.S. and, at age 12, became one of Jascha Heifetz’s youngest students. He earned both his Bachelor of Music and Master of Music degrees from the Juilliard School, where he studied with Ivan Galamian and Dorothy DeLay. Mr. Kwak plays on a J. B. Guadagnini, ex “Brodsky”, circa 1751.